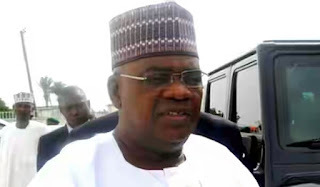 A Federal High Court, sitting in Jos, Plateau State, has issued a bench warrant for the arrest of a former Governor of Gombe State, Senator Danjuma Goje, for refusing to show up in court. The EFCC said in a Facebook post that Goje, who is being charged with an alleged N25bn fraud, might be arrested on Wednesday (today) if he failed to show up in court. Among several charges, Goje, who is the Chairman, Senate Committee on Appropriation, is accused of illegally awarding a N1bn contract for the supply of dictionaries to secondary schools while he was governor of the state. At the last sitting, a prosecution witness, Salisu Abaji, said the ex-governor awarded a contract for the supply of dictionaries for over N1bn to Gombe State Universal Basic Education Board without following procurement process. He was also alleged to have paid 85 per cent of the contract sum upfront to the supplier, Real and Integrated Hospitality Company, as against the prescribed 15 per cent as contained in the UBEB guidelines when he was the governor. The prosecution witness, who is a former secretary to UBEB, made this testimony against his former boss. He further submitted that one Aliyu el-Naffty, former UBEB chairman, also an accused person standing trial along with Goje, awarded the contract the same day and ordered the advance payment based on the directive of the then governor. Another prosecution witness and former storekeeper to Gombe State Government House, Mr. Mohammed Aliyu, concluded his testimony by tendering receipts of all payments made to the food contractor to the government during the eight-year administration of Goje from 2003 to 2011. However, Abaji admitted that he played a role in the award and payment of the said amount as upfront to the contractor. Meanwhile, the acting Chairman of the EFCC, Mr. Ibrahim Magu, said enforcement alone could not stop corruption, adding that the commission would also focus on preventive measures in the fight against corruption. The EFCC boss said this at the unveiling of the EFCC Creative Youths Initiative against Corruption in Abuja on Tuesday. He said, “We are the first to recognise that enforcement alone cannot win the war against corruption. Prevention is an effective and necessary weapon that must be employed in conjunction with enforcement, and there is no group of Nigerians better equipped to wield that weapon than the youth. Magu said the EFCC would not relent in its efforts to rid the nation of corruption. He added that the commission would continue to recover stolen assets and funds. “Let me clarify that EFCC will continue to vigorously enforce its mandate alongside engaging in preventive initiatives such as this. Therefore, even as we appeal to the old and the young to shun corruption and other forms of fraud, expect to see more investigations, more arrests, more trials, more convictions and more recovery of stolen assets,” Magu said. The event attracted pupils from several schools across the country.